The Apple Watch – the company’s first new product category since the iPad in 2010 – has debuted around the world.But unlike previous product launches people must order online and the device will be delivered to them or made available for collection from 24 April. Prices start at £299 for the sport edition and run to upwards of £13,000 for the gold Apple Watch Edition model. The watches are available to view in store in the UK and eight other markets around the world, including the US and China. In central Shanghai, web designer Li Hao, 27, said he was impressed by the build of the gadget. “It was beautifully made, like an expensive watch. I cannot do sports with the mobile phone. 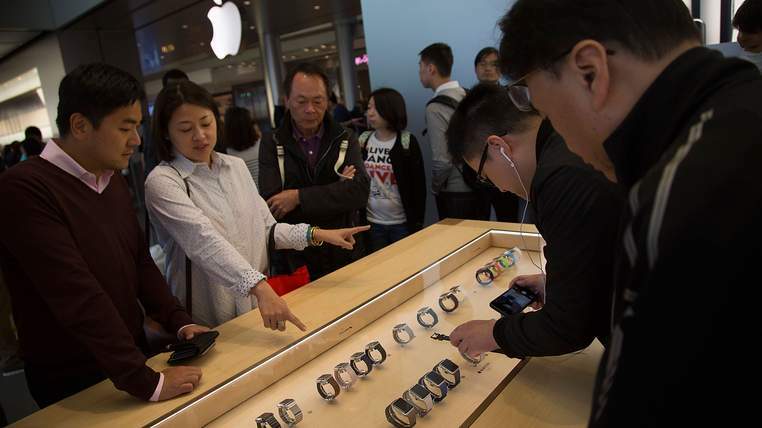 Another customer, Qi Tian, said he was “not a big fan” of Apple but would still order the Apple Watch. Apple chief executive Tim Cook has previously said: “The Apple Watch is the most personal device we have ever created. It is not just with you, it is on you.